Tampa Bay's Nikita Kucherov and New York's Dan Girardi battle for the puck during the second period of the Lightning's 4-3 loss to the Rangers. TAMPA, Fla. — Pump the brakes. Pause for a moment of caution. The NHL season is long. Too long not to live a few lows with the highs, some tough blips with the good. The Tampa Bay Lightning’s losses over the weekend to the Montreal Canadiens (Saturday) and New York Rangers (Sunday) are no excuse to toss your hockey sticks and start scrambling. Still, introspection after a few letdowns can be healthy. "If you want to be in the conversation March and April, you have to find a way to win one-goal games, and you have to find a way to win in the third period," Bolts coach Jon Cooper said Saturday. "Sometimes, it’s not always going to go your way." Things didn’t go the Bolts’ way over the weekend. The narrowest of margins is to blame for the end of their five-game winning streak. They outshot the Canadiens 24-21, but they lost in a shootout when center Lars Eller slipped the puck past Ben Bishop for the only score of the extra session. They outshot the Rangers 40-29, but New York beat Anders Lindback for four goals to hand Cooper’s team consecutive defeats for the first time since it dropped games to the Winnipeg Jets and Washington Capitals on Dec. 7 and Dec. 10. Slow starts and sloppy play were the culprits for these speed bumps. On both occasions, the opponent jumped to an early lead. On both occasions, the Bolts were left to scramble to a tie, only to see the Canadiens and Rangers skate from Tampa Bay Times Forum with victories -â meaning the Lightning lost at home in consecutive games for the first time this season. "We just won five in a row," Bolts winger Ondrej Palat said Saturday. "We thought it was going to be easy at home. We had a slow start. We got better in the third period." No season is a completely smooth ride. Inconsistency is one reality worth counting on. The Bolts have navigated through more than their fair share of chop over the schedule’s first three months: Moving on without Vinny Lecavalier, the Steven Stamkos injury, the four-game stumble throughout the West Coast in November, the health issues and the struggle to produce goals with a new identity. 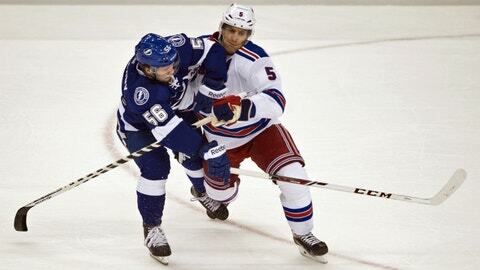 Credit Cooper and captain Marty St. Louis for Tampa Bay’s current position. Even with the weekend losses, the Bolts are 23-12-4, and their 50 points are good for second in the Eastern Conference, behind the Boston Bruins’ 54. Their 14-4-2 home record is second-best in the conference, behind the Bruins’ 16-3-2 mark at TD Garden. This roster is filled with new roles — from Cooper to key players to members further down the bench. There’s new responsibility. Flexibility is required, too. Already, the Bolts have evolved multiple times. This is a team that has grown with a new captain and learned to live without one of the league’s brightest young stars. This is a team that has seen an uptick in production — they have scored at least three goals in their past five non-shootout results, bumping their average to 2.69 goals per game, good for 12th in the league. Still, this past weekend could serve as a constructive reality check. Starting Wednesday, Tampa Bay embarks on a four-game road trip through Canada, with contests at Vancouver and Calgary, Edmonton and Winnipeg. The Bolts last lost three consecutive times during the West Coast swoon. But in the weeks since that lull, they have appeared less rattled by Stamkos’ absence. So what should happen next to prevent another skid? A word of caution: Don’t allow the near-misses to become more. After living a high — like the Bolts had done throughout most of December’s second half — it’s easy to let potholes become craters. The Bolts can’t allow this Canada swing to become West Coast Trip 2.0. They can’t allow themselves to give back most of the good they built during their recent winning streak. They’re still in good shape. There are still more than three months left to learn about this team. The upcoming schedule could include Stamkos’ return, St. Louis’ continued development as captain and a push for the franchise’s first postseason berth since the 2010-11 campaign. There’s intrigue. There’s reason to think this team has staying power. Still, good teams — playoff-worthy teams — allow "sloppy" to become opportunity. The Bolts, after their last two losses, have that chance glaring at them before it’s wheels-up to Canada to kick off 2014. "Yeah, especially when we didn’t play our best," Bolts goalie Ben Bishop said Saturday, when asked if it was reassuring to receive a point despite the loss. "We didn’t show up for 20 minutes, and that’s what happened." The Bolts can’t allow a few bad blips to become their identity. Caution is good for at least one thing: It’s a reminder that there’s always room to grow.